Trenton resident Dawn Jones works as a full time nurse at a hospital in North Jersey and a part-time one in South Jersey. 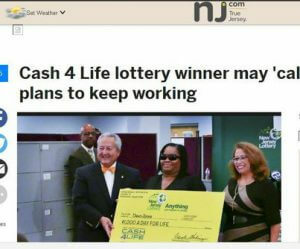 Yet after she learned that she had won the lottery she still went to work! Jones won a $1.000 a day for life prize in the Cash 4 Life game. She says that now she is a millionaire, she plans to stay one. She is not even considering quitting her two jobs, though she says she may reduce the working hours. She says now her daughters have college money and she may even move to a better place.